This unit introduces and explores the major concepts and perspectives in leadership and governance. In order to succeed in today’s professional world, it is as important to be aware and understand the dynamics that influence organisational life as it is to possess technical and task oriented skills. People at different levels in organisations are expected to lead, inspire and energize their colleagues, departments and whole organisations. As the environment in which organisations operate rapidly changes, new forms of leadership and governance emerge. These trends and their implications will be analysed and discussed in this unit of study. This unit is a core unit in the BBUS program and an elective unit in the BBIS program. [ULO1] Demonstrate an understanding of the interconnectedness between leadership styles and governance models applied in present day organisations. [ULO2] Develop self-reflection about one’s own preferred style of leadership, the ensuing impact and effectiveness. [ULO3] Interpret how networked organisations can be effectively managed by leaders. [ULO4] Assess the importance of ethics, diversity and politics to effective leadership. [ULO5] Monitor performance and evaluate corporate direction. 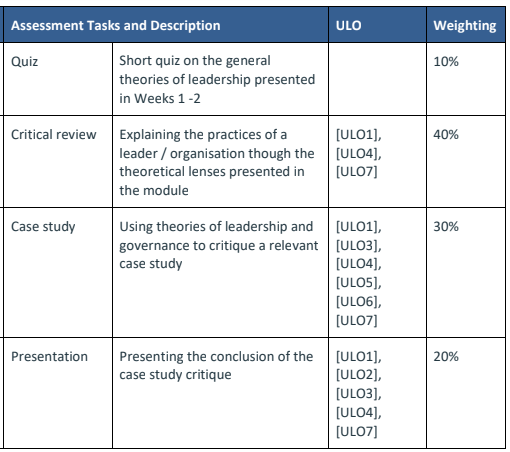 [ULO6] Use audits for organisational compliance and risk management. [ULO7] Demonstrate an understanding of the perspectives of different stakeholders in a corporate: employees, owners, managers, sustainability and society. This unit is delivered over 14 weeks, comprised of 12 weeks of classes and a one-week final examination period. Unit content is delivered to students via lectures and tutorials, and totals 4 student contact hours per week. Students will participate in teaching and learning activities including ‘activity-based learning’ under academic supervision, with frequent interaction with fellow students and the faculty, who will also provide frequent feedbacks to individuals and the class as a whole. 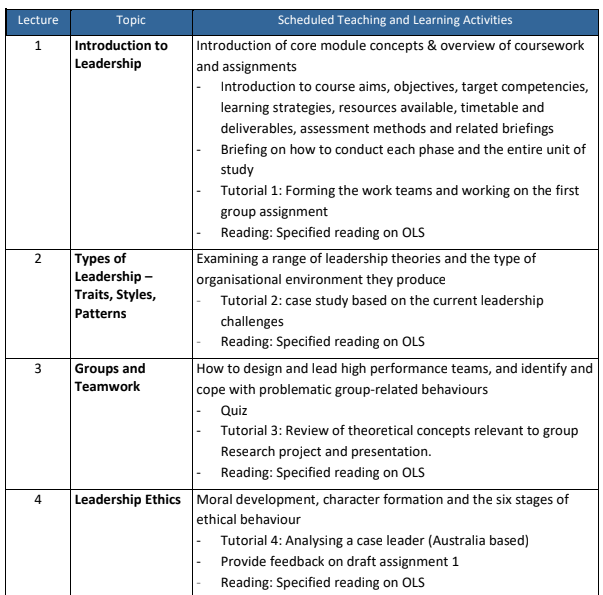 In addition to timetabled contact hours, students are expected to do at least 4 hours of personal study each week to review lectures and read prescribed and recommended materials for this unit. The expected total individual workload for this unit is 140 hours (including in-class activities and individual self-study). This unit does not include a Work Integrated Learning (WIL) component. • [CLO1] Broad and coherent knowledge of a range of business and related disciplines including accounting, project management, economics, statistics, general management, and marketing. • [CLO5] Communication skills to work effectively with people and teams and to present clear and coherent information in business, professional and academic formats. • [CLO6] Through the resolution of problems and decision making in a range of business and related disciplines including accounting, project management, economics, statistics, general management, and marketing. • [CLO7] Through the identification, implementation, and evaluation of innovative and professional business practice. • [CLO8] With responsibility and accountability for their own learning and professional practice and ethical standards, and in collaboration with others within a business or industry environment. • Assessment provides opportunities for students to apply and demonstrate their learning in a variety of ways, including both individually and working in groups. 2: Literature Review: Review the theories of leadership, teamwork, ethics, diversity and change presented throughout the module. Deepen the review with references to academic research (appropriate readings). 3: Critical Study: Use these theories to analyse the leader of your choice. Use academic research and popular media to provide evidence regarding how well the chosen leader does or does not follow the theoretical ideas presented in the review section. 4: Conclusion: Conclude with a critical description of the leader, outlining his/her strengths and weaknesses, and suggestions on how he/she might improve his/her leadership. Case Study: CEO: power, accountability and transparency. The purpose of this assignment is to combine the theories of leadership presented in the first half of the course with concepts of power, politics, corporate social responsibility and governance presented during the second half of the course. 2: The case study argues that the CEO is the focal point in a company’s governance – the ultimate decision maker responsible before all stakeholders. Explain, in detail and supported by theories from the module, how a high performing CEO should be leading by example. 3: The case study suggests that CEOs must leverage the loyalty of their employees and help them feel they belong. Get MGT601 Dynamic Leadership Assignment written by experts.